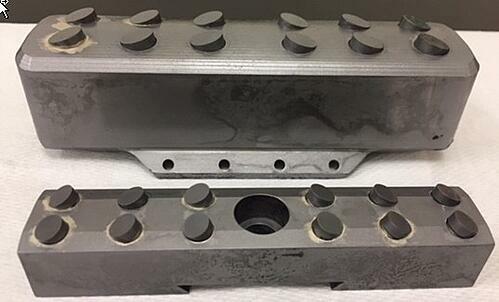 A company in the oil and gas industry turned to Ambrell because they were looking to heat steel blocks and carbide buttons for a brazing application. The end product was a gripper, and there were two different size assemblies that required testing. THE LAB at Ambrell determined that an Ambrell EASYHEATTM 10 kW, 150-400 kHz induction heating system was the right solution based on their application requirements. They also designed a single position multiple-turn helical coil for the testing. Temperature indicating paint was applied to both size parts, which dissolves when the part reaches target temperature. The blocks were coated with black flux and 12 braze alloy discs were inserted, followed by 12 carbon buttons. It took 100 seconds to heat the larger sample and 130 seconds to heat the smaller sample. With the smaller sample it was necessary to decrease the power to prevent the buttons from being ejected from the cavities at the onset of induction power, which explains the slightly longer heating time. Advantages of induction for this application include repeatability as the client can expect the same result every time, safety given there's no open flame or unnecessary heat being introduced into the work environment, and the EASYHEAT's modest footprint which takes up little floor space. To learn about other brazing applications assessed by THE LAB at Ambrell visit our applications page.